Back and joint pain can be caused by car accidents, workplace injuries, sports and athletic training as well as common everyday functions like operating a computer keyboard and mouse. Sufferers dealing with the pain can feel miserable and even physically ill. Joint pain can affect one's overall attitude and productivity. If dealt with properly using the latest technology and techniques the results can seem miraculous! 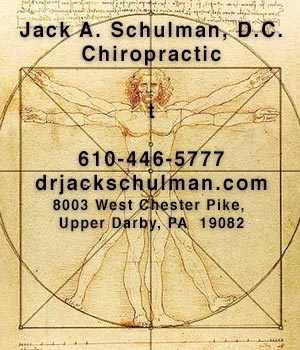 iRadioPhilly sat down with Philadelphia area Chiropractor, Jack A. Schulman, D.C. and talked about causes of joint pain and the latest techniques on treating back and joint pain. In the interview Dr. Schulman discusses manipulation, exercises and other treatments. Dr. Schulman discusses back, neck, elbow, knee injuries as well as carpal tunnel syndrome, sports injuries and bad sleeping posture and the pain it can cause. Listen to the interview for Dr. Schulman suggestions and remedies for relief.